For about 85 million Americans, owning a pet is a joy and marvel of everyday life. Indeed, according to the 2017 - 2018 National Pet Owners Survey, about 68% of US households own a pet. This marks a remarkable 56% increase from pet ownership levels in 1988, the first year the survey was conducted. That’s a lot of furry and fuzzy (and fishy and flighty) friends across the country. Many of these pets are considered a part of the family because of the companionship they offer. According to a 2015 poll, 95% of pet owners in America think of their animal as a member of the family; even going so far as to buy them birthday presents! This perhaps explains why for many, no amount of money can replace the happiness and health benefits of owning a pet. In terms of health benefits of owning pets, there’s a wide swath of research that digs into the social, emotional, and physical benefits of pet ownership. For instance, pets can help lower a child’s likelihood of developing pet-related allergies, help strengthen their immune system overall, and increase confidence and empathy. For adults with pets, both the Centers for Disease Control (CDC) and the National Institute of Health (NIH) have conducted heart-related studies which found that pet owners have decreased blood pressure, cholesterol and triglyceride levels – which can help reduce the risk for heart attacks and heart disease. There are also many social benefits to owning a pet. Pets often act as an instant icebreaker and can improve socialization skills – for people of all ages – across the board, especially when it comes to meeting and interacting with other pet owners. For dog owners, the social benefits of owning a pet are old news – walking your dog often means that you meet your neighbors, are invited to community events by other dog walkers, and are approached by people wanting to pet your dog on a regular basis. That said, owning a pet can be an expensive undertaking when factored out over a lifetime. In a recent report published by the U.K.-based People’s Dispensary for Sick Animals (PDSA), it was revealed that an astonishing 98% of polled pet owners significantly underestimated the lifetime cost of owning a pet. A majority of pet owners were sure costs would not exceed $6,445, while 12% believed that they would only pay $644 in expenses over time. When factoring the ongoing costs of food, vaccinations, toys, trips to the vet, and in some cases neutering, grooming and spaying, the dollar amount can climb quickly. According to the same PSDA report, it turns out that over the likely course of a dog or a cat’s life—call it 10 years—the costs can easily exceed $20,000. The study found that for a cat, the lifetime costs could range from $21,000 - $31,000, and for a dog the number jumps to $27,000 - $42,500. These figures account for all the factors listed above, but don’t consider the need for emergency treatments, insurance, or other health issues. 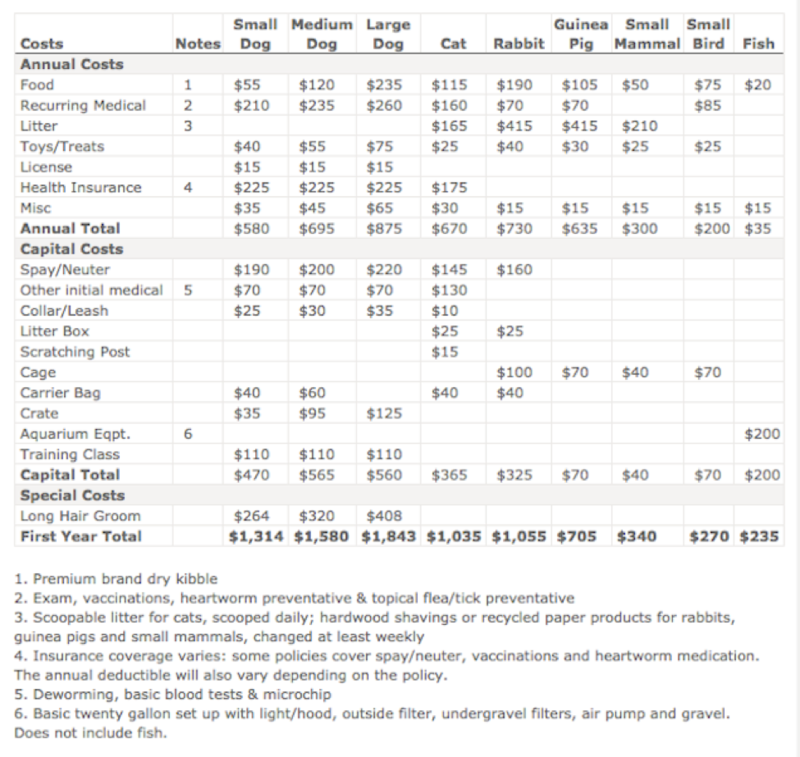 The above chart from the ASPCA breaks down many of the hard costs a new pet owner should expect in the first year after adopting a variety of animals. Owning a pet can be a very rewarding, joy-inducing experience, and although expensive, it makes sense that a wide majority of pet owners say the decision to own a pet makes them happier and healthier. That’s why in America there are approximately 139 million pet fish, 94 million pet cats, 89 million pet dogs, and 20 million pet birds. Of the more than 4,000 pet owners surveyed by the PDSA, 93% reported that having a pet brings happiness – a beautiful thing. While it may seem unusual, including your pet companions in your financial plan can have long-term benefits for both yourself and the pet. 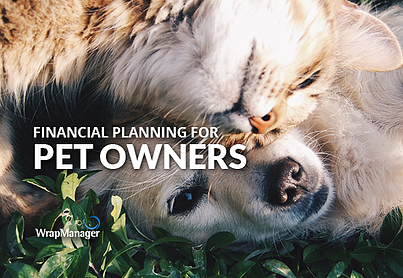 If you are interested in learning more about how to include your pet(s) in your financial plan, the Wealth Managers at WrapManager would be happy to help guide you. You can speak with one by calling 800-541-7774 or filling out a contact form here.